Deceptively large pub situated beside the railway arches in Borough Market, very close to London Bridge underground and rail stations. This pub is a real magnet for real ale drinkers with its large and varied selection of well-kept beers. Harveys Best is a constant but the other selections vary. I think there are about 10 handpumps active usually. Food is available at lunch times only but I’ve never eaten here. There’s a function room for hire too. 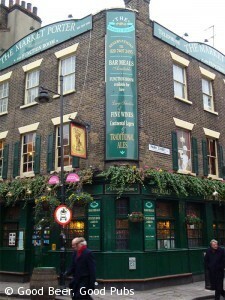 The Market Porter gets extremely busy but the atmosphere is lively, not oppressive. Expect to see most people drinking on the pavement outside – in all weathers.